Established in the year of 2008 and located at Nashik, Maharashtra, India, we, “Ameet Metaplast Private Limited”, hold specialize in manufacturing, supplying, trading and exporting a wide range of world class Packaging Materials. In this, we offer an exclusive range of Packaging Film, Wrap Around Labels, BOPP Wrap Around, OPP Wrap Around Labels, PET Shrink Labels, Busbar Grade Film, Battery Grade Film, General Packaging Shrink Sleeves, PVC Shrink Films etc. Our offered range of packaging products is widely used in the various industries such as cosmetics, mineral water, paint, dairy and FMCG. Perfectly manufactured, our range is known for its remarkable features such as durable finish and tamper proof nature. Our entire business of packaging sector is divided into two divisions. Ameet Poly-films Pvt. 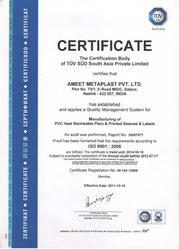 Ltd.(Established in 1993) and Ameet Metaplast Pvt. Ltd. These divisions deal in Shrink Packaging range like Insulating Grade film/ sleeve, that includes Bus-bar, Capacitor, Refrigerator and Battery grade sleeves. Our recently launched third division Ameet Metaplast Pvt. Ltd. offers PVC Cast as well as PET shrink Labels, BOPP & OPS Labels and fully automatic 10 color rotogravure printing machines. This division alone delivers production equal to 110 Tons per month. In packaging sector under the Ameet group currently, we are associated with some of the top brands like Dabur, Castrol, UB group and Future group. Our exporter countries are UAE, Bangladesh and Sri Lanka. Under the guidance of our CEO, Mr. Nilesh Ahire, we have become successful in carving a niche in this domain. With his discerning insight and in-depth knowledge of industry, we have been able to perceive and understand the specific requirements of our clients and sequentially made a huge client base. He has taught us ethical business strategies that have helped us in touching greater heights of progress. Manufacturing and Trading of PVC Shrink and BOPP Labels. We are the expert manufacturer of premium quality range of a variety of Packaging Materials. Available in different length, width and thickness, these packaging materials offer an economical way of packing the luggage and other items. These features inflammability, high shrink ability and tensile strength. Our organization aims to manufacture and market quality products. We have the team of expert professionals, all of whom work diligently towards the accomplishment of the goal. The raw materials used in the manufacturing processes are contrived from the reliable vendors. We have established a developed quality testing unit, where our quality analysts conduct regular quality check of our products on different parameters. Backed by an expert team of professionals, who with proficiency and dedication work towards a common goal, that is delivering superior quality products, thereby gaining huge customer satisfaction. Our workforce is divided into suitable divisions, that have diligent people who work relentlessly towards their assigned-task. They devise the appearance, features and performance of the products. They keep themselves abreast with the latest developments ongoing in the market and accordingly carry out improvisations. They conduct strict quality checks, starting form the procurement of raw materials to all-through production, till the finished product. Our state-of-the-art infrastructure is the most integral part of our company that helps us stand out among our competitors. Using our well developed infrastructure, we are able to complete large volumes of products within the shortest period of time. We have installed all modern machines and equipment that are easy to operate and give excellent performance. These machines and equipment are regularly maintained by our expert technical staff so as to keep them smooth in functioning. If required, regular up-gradation is done at par with latest trends and manufacturing requirements. We have an extensive Research and Development division built over a wide area. The r & d professionals are responsible for bring developments to the organization. They conduct regular surveys regarding our products, which provides information regarding product quality and user satisfaction. Various case studies are organized on regular basis, that helps us to calculate the average sale of our production. In addition to it, r & d team members keep themselves updated about the latest development in the market. We produce superior quality packaging materials, including Laminates, Roll Forms, Films and Sheets. Our products provide high level safety from breakage, leakage and hard chemical reactions. The raw materials used in their production, are of best quality and are procured from the trusted suppliers. Further using latest technology and advanced machines, these are fabricated into strong packaging items. Our vendors are among the leading ones and reckoned in the respective domain. Packaging is the finishing touch required for every product that need to be marketed. And this widens the application areas of our packaging materials. We offer diverse customized solutions to our clients. We fabricate our entire production to conform to the requirements of our clients. We offer labels, films and sheets in various length, width and thickness. Shrink ratio and tolerance rate can also be raised on being stated by customer. Client can also avail from us improvisations regarding print of the product. It involves transparent or opaque medium and in different colors. We follow ethical trade policies and fair dealings in our business. With this, we have unique factors like client centric approach, on-time delivery, flawless product improvisations and strict adherence to superior quality of products. Owing to these very factors, we have been able to carve a niche in the manufacturing domain of premium quality packaging materials. Meet Group has following esteemed customers A.B.D. Ltd.
We provide a world class range of packaging materials, each product of which is a huge assortment of unique features. With this, below are given key factors, which help us stand apart from our competitors.